The story of Cinderella is actually an ancient tale, and arguably the best known fairy tale. Although the most familiar retelling is Charles Perrault's Cendrillon, published in France in 1697, modern day readers more likely picture the blonde-haired, blue eyed Cinderella of Disney fame. But according to the Author's Note in Smoky Mountain Rose: An Appalachian Cinderella, the tale can be traced all the way back to China, circa 850 AD (see Yeh-Shen: A Cinderella Story from China). Scholars, in fact, have gathered over 500 versions of the tale. So what is it about this tale that has proven timeless? Why does it continue to capture the imagination of children generation after generation? And more importantly, what surprises are contained in these other variations on the Cinderella tale, collected from all over the world? Before I discuss individual books, let me say that if you're really serious about a Cinderella unit, I cannot recommend In Search of Cinderella: A Curriculum for the 21st Century by Katharine Goodwin highly enough. This curriculum guide features book talks on a wide variety of Cinderella tales, along with activity sheets for each. What I love most about it is its emphasis of motifs; if children can learn to recognize narrative patterns within the stories they read, they will read those stories (and others as well) with much greater comprehension. 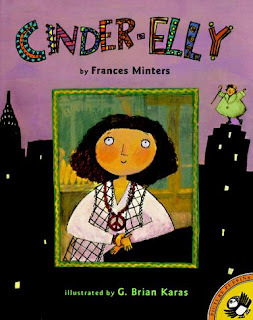 This excellent resource book also provides activities to teach analogies, grammar, vocabulary, text structure, poetry, and writing, all through interactions with the authentic Cinderella texts. 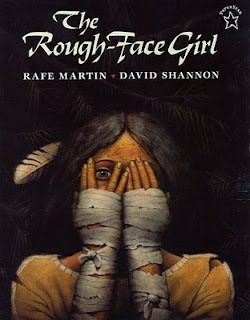 The Rough-Face Girl by Rafe Martin is an Algonquin Indian version of the Cinderella story. Two domineering sisters (who modern readers instantly recognize!) set out to marry the "rich, powerful, and supposedly handsome" Invisible Being. But as in many other tales, a test is involved: they must first prove that they can see him. They cannot, but their abused younger sister, the Rough-Face Girl, can, for she sees his "sweet yet awesome face" all around her. He appears to her, reveals her true hidden beauty, and marries her. David Shannon (creator of the popular No, David! 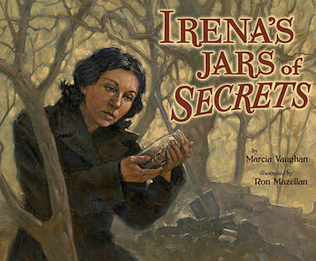 series and illustrator of Jane Yolen's powerful Encounter) paints powerful, iconic figures and evocative scenes of nature and Native American life. Both this book and Sootface: An Ojibwa Cinderella Story, retold by Robert D. San Souci and illustrated by Daniel San Souci, would be excellent additions to units on Native Americans, and a perfect segue into a study of other Cinderella books. Now lis'en. Smack in the heart o' the Smoky Mountains, there was this old trapper livin' in a log cabin with his daughter. One night, while Rose was fryin' a mess o' fish, the trapper, he starts lookin' dejected like. Everyone knows what's going to happen, but getting there is half the fun. Sneed's slick, stylized watercolors seem at first to be out of sync with the down-home narrative, but it quickly becomes clear that the disparate union is a successful one. The paintings are realistically rendered but slightly distorted; figures are elongated and angular, features exaggerated, and perspectives askew... The fanciful, but decidedly quirky artwork effectively informs readers, in case they didn't already know it, that there's magic in them thar hills. An appealing all-American addition to the canon of "Cinderella" variants. Smoky Mountain Rose is one of my favorite new versions of this tale. 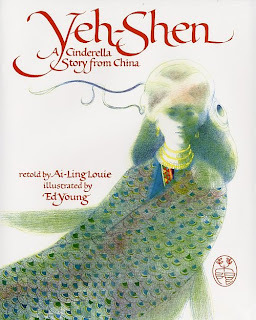 (Note that later versions feature a different cover which prominently features a glass slipper, obviously meant to draw in more young readers already familiar with the Cinderella tale). 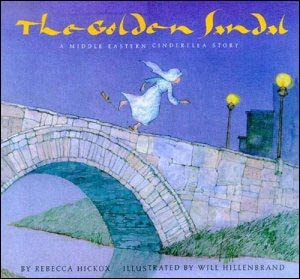 The Golden Sandal: A Middle Eastern Cinderella Story, retold by Rebecca Hickox with illustrations by Will Hillenbrand, is based on the Iraqi folktale of "The Little Red Fish and the Clog of Gold." In this tale, young Maha wishes for her widowed father to remarry the kindly neighbor lady who has a daughter of her own. Maha gets her wish, but in true Cinderella tradition her stepmother makes her do all the work while her stepsister makes the work all the more difficult. One day Maha spares the life of a small red fish, who from then on helps her out of many difficult situations, since he has promised her that she can "call for me any time and ask what you will." This same magic fish helps Maha prepare for the big event in town, where her beauty and grace are noticed by her future mother-in-law, who does the searching for the "dainty foot" which is also such a critical component of most Cinderella tales. (This lesson plan challenges students to read and compare four Middle Eastern Cindrella tales, including The Golden Sandal). 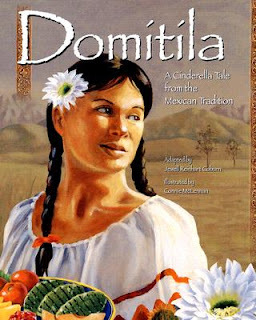 Domitila: A Cinderella Tale from the Mexican Tradition, is an impressive take on the Cinderella tale. First of all, it's one of the few versions where characters show growth (in this case, the arrogant politician's son becomes compassionate). It's also a version which doesn't rely upon magic to save the day, but rather upon Domitila's innate qualities. There's more sophisticated language structure here as well, and of course a wonderful dose of Mexican culture. What I found to be very clever was that each page included (along with the text and large illustrations) a moral, printed in both Spanish and English. Students would enjoy discussing what is meant by "Deeds, more than words, are proof of love," and "A task well done cannot be hidden." Even the border decorations around the text beg to be deciphered on each page. 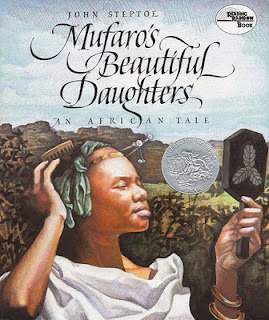 The Caldecott Honor Book Mufaro's Beautiful Daughters tells of two beautiful sisters: Nyasha who is selfless and considerate, and Manyara who is selfish and spoiled. They are equally loved by their father who sees no faults in either. When the king announces that he will take a wife and invites "The Most Worthy and Beautiful Daughters in the Land" to appear before him, Manyara sets out to make certain that she will be chosen. Each girl undergoes a very different experience along the way, based upon their unique dispositions. 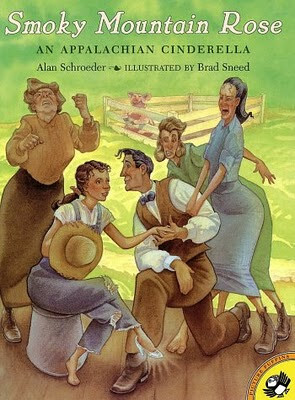 The late John Steptoe's illustrations make this a fabulous addition to any home or classroom library. 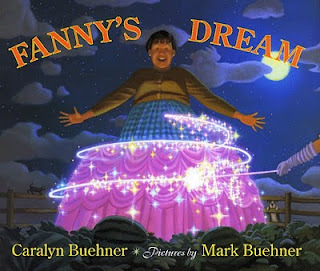 In Fanny's Dream, written by Caralyn Buehner and illustrated by Mark Buehner, plain and simple Fanny chooses to marry an ordinary man and live an ordinary and, at times, even difficult life, running a farm and raising children. When given the chance to exchange it all for that trip to the ball which she always dreamed of, what choice will she make? This book is definitely one from the category of "Anti-Cinderella" books. Although she doesn't have that same cliched experience as our other heroines, perhaps she lives to be the happiest of all. A wonderful tale with gorgeous pictures by this husband and wife team. Cinder-Elly is a modern, hip-hop version of the old Cinderella tale. In this version we find Cinder-Elly living a funky lifestyle in New York City, and she's invited not to a ball, but to a ball game. The story is told in rhyming four line stanzas, which makes it not only fun and lyrical to read, but perfect for chanting, rapping, or singing. I'm also a big fan of illustrator G. Brian Karas' simple, cartoon-like renderings. Cinder-Elly is a creative and appealing version for younger readers, or as an inspiration for older readers to "modernize" similar traditional tales. In The Way Meat Loves Salt: A Cinderella Tale from the Jewish Tradition, the rabbi loves his three daughters very much, but one day wonders, "How much do they love me?" When asked, the eldest daughter replies that she loves him as much as diamonds. The middle daughter replies that she loves him as much as silver and gold. But the youngest, named Mireleh, replies that she loves him "the way meat loves salt." Insulted and hurt, the rabbi banishes her from his house and family. Mireleh begins living the life of a servant girl, assisted first by a kindly old man who gives her a magical stick, and later by a family that feels takes pity on her. From this point on, the more traditional events of the Cinderella tale take place, but it's through Mireleh's own ingenuity, rather than the timely rescue of a Prince Charming, that she gets what she wants. The author's introduction explains the origin of this tale and how it relates to both traditional Cinderella tales and other Jewish folktales. Yeh-Shen, retold by Ai-Ling Louie, is probably the oldest version we're apt to find. Unlike most other Cinderella tales that we're told, however, this one features a more ethical heroine. The reader doesn't pity her, but feels instead that Yeh-Shen truly earns the "happily ever after" based upon her actions toward others. This series of activity pages from abcteach.com assesses student understanding of sequencing, vocabulary, and story elements from Yeh-Shen. Two others I'd recommend? If the Shoes Fits: Voices from Cinderella by Laura Whipple shares various perspectives from characters in our favorite fairy tales, all told in poem form. The Hummingbird King by Argentina Palacios is a South American legend with motifs we recognize from Cinderella, but with a terrific "flavor" of that continent. If you're looking for an interactive version of Cinderella, Annenberg Media provides an animated, narrated version of the most familiar retelling. But this retelling is actually just a small part of the Annenberg activity which is called Interactives: Elements of a Story. This self-guided learning module uses the traditional tale to help students understand Setting, Characters, Sequence, Exposition, Conflict, Climax, and Resolution. Each story element tests students along the way, and a summative assessment not only allows a teacher to see a student's overall understanding, but allows the students to revisit sections of the tutorial to self-correct missed responses. A very cool activity overall, appropriate for grades 3-5. Also be sure to see the Tips for Adults section of this site, which features links and extension activities for the Cinderella tale. (If you dig this site's format but you teach older grades, be sure to check out the Annenberg literature interactive for older students based upon Susan Glaspell's short story "A Jury of Her Peers"). Looking for an older, more "authentic" telling? National Geographic's Grimm Brothers site features the Grimm retelling of the Cinderella tale, which is a bit more PG-13 (for its gruesomeness). Older students might enjoy reading less "cuddly" versions of storybook favorites there. Web English Teacher has compiled a wonderful list of links to activities, as well as additional book titles. At ReadWriteThink you'll find a six-session critical thinking unit on Behind the Scenes with Cinderella. For high school teachers, a lesson plan specifically designed for that age group on Cinderella as a Mirror of Culture. Finally, see your tax dollars at work by checking out EdSiteMent's Cinderella Folk Tales: Variations in Plot and Setting, a surprisingly comprehensive lesson plan and resource list. This site can be stand-alone, or used as a prequel to EdSiteMent's Cinderella Folk Tales: Variations in Character. If you're looking for a terrific collection of Cinderella books for your elementary curriculum, The Booksource has a nicely chosen set of fifteen Cinderella tales at a reasonable price. It includes many of the titles from above, plus others you'll want to explore. I totally forgot about having Rough-Face Girl. And I'll have to track down the Appalachian version for when we get to that area of the US. I love Cinderella stories! I teach at a school with a very high Hispanic population so the Domatila would be a great read!! Thanks for sharing. Thanks for the comments on tales which you feel would be good for your own lessons. Belive me, even when I finished this post I remembered a couple others I should have included! Thank you for this brilliant post - it's really inspiring and makes me want to get hold of each and every book you've mentioned! I've a post tomorrow which features Yeh-Shen and I'll link back to this. This is brilliant! We will have to do this unit when our daughter is older. thanks!